During his tenure as governor, Mitch Daniels launched three of the biggest land preservation projects in Indiana history, prompting the state's Nature Conservancy to call him the "Teddy Roosevelt of Indiana." Right setting: John Goss, lower right, talks with members of the Wabash River Heritage Corridor Committee and The Nature Conservancy along with Indiana Department of Natural Resources employees about the silver, or Asian carp. 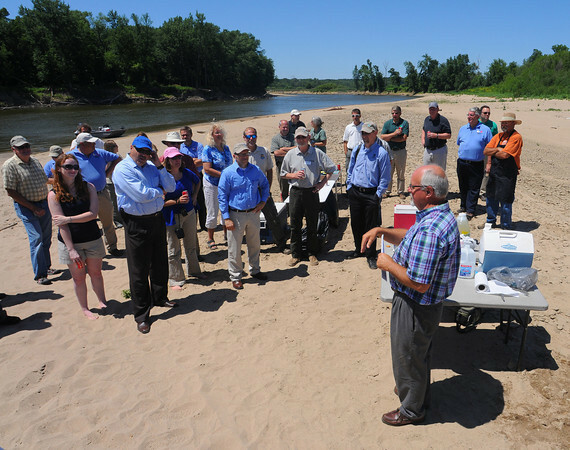 The luncheon and meeting were held on a sand bar on the Wabash River in northern Vigo County in June of 2012.